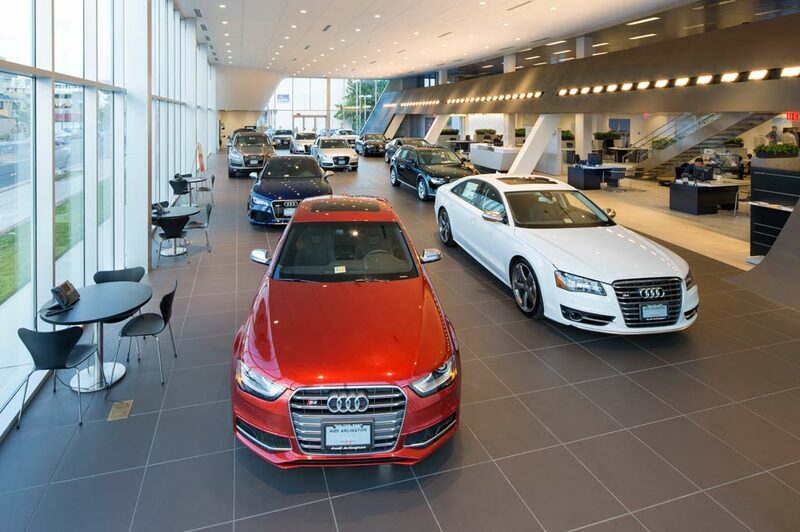 Audi Frederick in Frederick, MD treats the needs of each individual customer with paramount concern. We know that you have high expectations, and as a car dealer we enjoy the challenge of meeting and exceeding those standards each and every time. Allow us to demonstrate our commitment to excellence! Our experienced sales staff is eager to share its knowledge and enthusiasm with you. We encourage you to browse our online inventory, schedule a test drive and investigate financing options. You can also request more information about a vehicle using our online form or by calling (855) 384-9678. Welcome to Audi Frederick, your preferred Frederick, MD car dealership for luxury Audi cars, crossovers and SUVs. While you're here, you can explore our extensive selection of new and Certified Pre-Owned Audi models and quality pre-owned vehicles available at our lowest price. You can also learn more about financing for a new Audi car or your options when it comes to leasing. Our dealership also offers luxury auto repair services, plus a well-stocked parts department featuring OEM Audi parts and accessories. Visit us today and let one of our knowledgeable and friendly staff members help you find the luxury and performance Audi you've always wanted at a great price. Browse our large inventory online, then schedule a test drive at our Frederick, MD car dealership today. Looking for used cars in Frederick? Audi Frederick also offers an extensive inventory of quality used vehicles from all the top makes and models, including some luxury manufacturers. Find your next quality pre-owned vehicle today from our premium lineup of BMW, Cadillac, INFINITI, Mercedes-Benz and Porsche models for less. These models often come with many of the luxurious features you've always wanted, such as leather seats, adaptive air suspension, head up displays and more, for less than you ever thought possible. Of course, you can always show our lineup of Certified Pre-Owned Audi models, which combine the luxury and quality of Audi and the value of a used vehicle. These vehicles have undergone extensive, meticulous inspections to ensure the best conditions. Many also come with premium features that are a step above other used cars, even luxury used. Choose from our inventory of late-model CPO Audi vehicles with features like Bang Olufsen® stereo systems, adaptive cruise control, heated steering wheel, heated seats, and more. Plus, after browsing our inventory, you can opt-in for receiving alerts when a price changes so that you're always shopping for the latest offers. We've also made it easy to access your saved cars on any device. If you haven't done so already, click here to start shopping our quality used and Certified Pre-Owned inventory. At Audi Frederick, we take pride in helping you obtain financing in a comfortable, pressure-free environment with professionals that are courteous and knowledgeable of the industry. No matter what your goals are, our Finance Center can help you understand all of your options.Whether you need a lower monthly payment or want to explore the best option between a car lease and buying, we're here to help. You can even start the pre-approval process online with our short and straightforward form. Once you complete our form, you'll know in a matter of minutes if you're pre-approved. This will help you reduce the time spent at the dealership during the finance process. If you prefer to do the entire process in person, you're more than welcome to stop by today. We can help you walk through the entire process to provide you the best experience possible. Whichever way you would like to proceed, we can help. Whether it's using our online form for pre-approval first, giving us a call, or doing the entire process at the dealership. Stop by our state-of-the-art service center and let our experienced technicians handle your next service or repair. Audi Frederick has a full staff of factory-trained technicians ready to help you with everything from a routine oil change to more complicated transmission repairs. We also routinely offer specials and promotions to help you maintain your Audi in top shape. Aside from that we also have a full parts department stocked with genuine Audi parts and accessories. Audi Frederick is fully committed to the quality of your luxury and performance Audi. So why trust your Audi with just anyone? Let the experts help you get back on the road safely and in a timely manner. For your convenience, you can schedule your service appointment online with our Frederick car dealership. Visit Audi Frederick today, your preferred luxury Audi dealer serving Frederick, Bethesda, Hagerstown, MD and the surrounding areas.